Asheville 1296 luxurious Owner's Bath with freestanding tub and Carerra marble. Is the tile on the floor Florentine matte finish? - We are considering this tile for our new master bath, but I am concerned about the possible color difference in the glossy finish (shower wall and tub surround) and the matte finish that has been recommended for the floor. Thoughts? Is the floor tile slippery? Beautiful paint color, would you mind sharing wha color it is? Thanks! Hello, may I please have the ceiling color and the closet color in the previous room as well? What a delightful combination. What is the brand/model of the light fixture above vanity? - What's is the brand/model of the light fixture, I believe the green tag is incorrect. wonderful - thanks so much! is that the kohler sunstroke tub? never mind, i just saw in comments, that it is kohler! Mosaic tiles in recessed wall in shower... - Very interested in knowing the color of mosaic and where to find the mosaic tiles in the shower recessed cubby? can you please tell us the exact mosaic used in shower niche and in front of shower entrance creating tile rug. Beautifully done! Who makes the vanity lighting and where can I get it? Thanks. when i pulled up link for vanity lighting, comes up as an error? Are both the floor tiles and counter top carrera? Did you find that the Dal Tile Flooring material was beiger than the actual carrara? Also, did you think that the shower tile (glossy) was whiter than the floor tile? Also, did you hand pick your tiles so that they would match up? I have only ever bought natural stone so this is new to me. Would love to know your advice. Thank you. Yes I agree with your comments on the color variation. This tile does vary from piece to piece but once it’s installed it looks great. The beauty Is in the forest not the individual trees so to say. I don’t think hand picking the tile is a realistic option unless you are doing a very small space and have a very patient installer. Best of luck with your project. Where can i purchase the vanity chair from? I love the chair and checked the website which said you can not buy it in the US. Is there a way to buy it through you? Depending on the seat height it would be perfect for my bath. Please advise. P. S. Love the bathroom! I am sorry but I can't help you with this request. You could try a local interior designer. Cabinets - Where bathroom vanity with cosmetic table purchased? Cost? Is it double vanity? The cabinetry is by Executive Cabinets. There is a second vanity just outside of the frame of the photo to the left, next to the tub. What is the name of the countertop material? Hello pklasing! It's a custom fabrication polished Italian Carrara marble vanity top. We can do the same one from our slabs for your bathroom. We also have a wide selection of marble slabs available, such as Bianco Carrera (White Carrara), Bianco Dolomiti (White Dolomite), Bardiglio Gray, Nero Marquina Black, White Onyx and Crema Marfil. Grizzle Grey by Sherwin williams. Marble or Porcelain - Hi there, is that real marble or porcelain tile that looks like marble? nicely done. What is the name of porcelain used? who is the maker of the bath tub? Thank you for your interest in Arthur Rutenberg Homes in Cincinnati. The bath tub is the Sunstruck by Kohler. What are the tile and counters? Thanks! Thank you for your interest in Arthur Rutenberg Homes in Cincinnati. The tile is by Daltile. It is Florentine FL06 Carrara with a glossy finish in the shower and matte finish on the floor. It is a glazed porcelain. The countertops are marble. can you tell me the size of the tile in the shower? What is the paint colour on the wall. Thank you for your interest in Arthur Rutenberg Homes. The wall paint is grizzle gray by Sherwin Williams. Will you share the ceiling color? It is a great compliment to the Grizzle Gray. Vanity? - Could you please share details about the vanity? Thank you! The cabinets are by Executive and they supplied the vanity trim piece. The countertops are Cararra Marble. Tub faucet - What is the tub faucet? Thank you for your interest in Arthur Rutenberg Homes in Cincinnati. The tub is the Sunstruck by Kohler with fluted shroud and the tub faucet is Voss by Moen in chrome. I love the bathtub and faucet. I am also looking for a very white colored granite like you have in this picture. What is the name of that granite, or is it marble? Thanks!! What is the shower flooring used? - I cannot see flooring in the shower and am considering using this floor and shower tile for my bathroom. I'd like an idea for shower flooring and love everything in this photo, so I trust your judgement. Thank you for your help. Gorgeous bathroom!!! Thank you for your interest in Arthur Rutenberg Homes in Cincinnati. We used a 2" x 4" subway tile with a matte, non-slip finish on the shower floor. What are the dimensions of the shower? - I am planning my master bathroom set up, so I am wondering what is the length and width of the shower? Thank you for your interest in Arthur Rutenberg Homes in Cincinnati. The interior dimensions of the shower are 4' 6" wide by 7' long. What is the source and name of the tile? New bathroom - Can you tell me what the smaller inset tiles are? In the shower shelf and on the floor? Can you tell me the name of the paint used as well as the name of the marble? TIA! The bathroom is gorgeous! Would you mind sharing the color used for the trim & ceiling? Thanks! Thank you for your interest in Arthur Rutenberg Homes in Cincinnati. The trim is Pure White and the ceilings are Shoji White. All of the paints are by Sherwin Williams. Chandelier - Where is the chandelier from? Thanks for sharing Arthur Rutenburg Homes - what a stunning application of our Nissé chandelier! Tile COF - Can this porcelain 24x24 be used in a shower floor? - Do you know if the floor tiles, in 24x24 format, are too slippery to be used in the floor of a large shower? We would not recommend a 24 x 24 for a shower floor. MST BA Paint Color - What is the wall paint color in MST BA? This is a very pretty room! Thanks! Thank you for your interest in Arthur Rutenberg Homes in Cincinnati, OH. The wall color is Grizzle Gray (SW7068) by Sherwin Williams. Drain - What kind of drain system was used for the shower? Gorgeous build. Thank you. I believe we used the Kohler 9136-cp, square drain. paint color please! - please! what is this amazing wall color? What color of paint is on the walls? Tile? - Is this Kargo WHITE porcelain tile? And if so what color did you use for the grout? Thank you! Universal Tile and Marble Inc.
An option instead of using this porcelain tile would be a honed Carrara White Italian marble, looks exactly like these tiles - a more luxurious option and a beautiful natural look. You are to be commended for your patience and professionalism - Not only did you share a lovely bathroom but you are so very patient in answering repetitive questions regarding the paint, tub, tile, lighting and cabinetry. Where can I purchase the vanity chair? I am sorry but we no longer have record of that purchase. Thank you for your interest in Arthur Rutenberg Homes in Cincinnati, OH. The walls are grizzle grey by Sherwin Williams. It is a matte finish. I would recommend matte finish for the floors. Beautiful vanity - What color is the vanity. Hello psevean! The top looks like made of Bianco Carrara marble. If you are interested in this tile, we can do the same one for your bathroom. We have a wide selection of marble slabs available, such as Bianco Carrera (White Carrara), Bianco Dolomiti (White Dolomite), Bardiglio Gray, Nero Marquina Black, White Onyx and Crema Marfil. What paint color are the walls and ceiling? The walls are Grizzle gray and ceiling is Sohji white by Sherwin Williams. The little stand by tub - Where did you get the stand by tub? I am sorry but we don't have record of where we purchased that piece. Grizzle gray by SW? - Grizzle gray..
What brand/name is the bathtub faucet? Thank you for your interest in Arthur Rutenberg Homes in Cincinnati. The bath tub faucet is Voss by Moen. Nice vanity chair - Hi, I like this vanity chair. Can you tell me where you bought it? Thanks. I am sorry but we don't have record of this information. The ceiling color is Sohji White by Sherwin Williams. Who manufactures the tub? 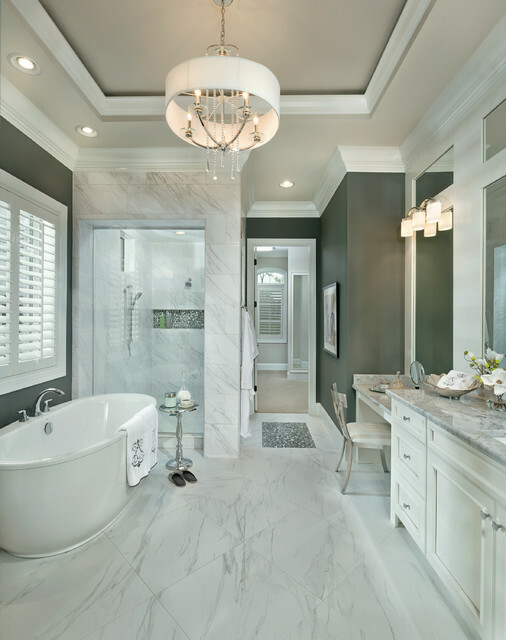 - I really like the freestanding tub and assume it is a soaking tub, a must-have for my remodel project. The tub is the Sunstruck by Kohler with fluted shroud. Best of luck with your project. Can you tell me the brand of the tub? - I like that it has a ledge for a faucet. The tub is the Sunstruck by Kohler with fluted shroud. Color of green - Color green name?supplier? The wall paint is actually a gray. Grizzle gray by Sherwin Williams. Porcelain floor tiles - porcelain floor but what color is the green wall? The walls are actually Grizzle grey by Sherwin Williams. Wall paint - What is the color of the paint on the walls? This is so very elegant! Could you say who makes the vanity & tub? Thank you for your interest in Arthur Rutenberg Homes. The tub is the Sunstruck by Kohler. Can you provide details on manufacturer and make of the shutters? Tx! Thank you for your interest in Arthur Rutenberg Homes in Cincinnati. Unfortunately we don't have record of the manufacturer of the shutters. Thank you for your interest in Arthur Rutenberg Homes in Cincinnati. The grout color is snow white by Polyblend. Size of the floor tiles - This is such a stunning bathroom! LOVE IT! We are designing our own master suite and this is definitely one of our top inspirations. Would you mind sharing the dimensions of the floor tile? Many thanks! Thank you for your interest in Arthur Rutenberg Homes in Cincinnati. The floor tile are 24" X 24". Let us know if you have other questions about the room. Paint - What color is the paint used on the walls? Thank you for your interest in Arthur Rutenberg Homes in Cincinnati, OH. The wall color is Grizzle Gray (SW7068) by Sherwin Williams. You can see this home in person at Carriage Hill in Liberty Township. Would you please tell me who makes the vanity? Shower Base- Who is the manufacturer and supplier of the shower pan? Thank you for your interest in Arthur Rutenberg Homes in Cincinnati. The shower floor is a traditional "mud pan" installed by our flooring vendor. Tiles - Where can I buy the tiles for this bathroom? Thank you for your interest in Arthur Rutenberg Homes in Cincinnati. The tile is by Daltile. It is Florentine FL06 Carrara with a glossy finish in the shower and matte finish on the floor. It is a glazed porcelain. What is the accent tile in the shower and on the floor in the entry? Thank you for your interest in Arthur Rutenberg Homes - Cincinnati. The countertops are Cararra marble. CERAMIC TILE OR MARBLE IN THE SHOWER ENCLOSURE. What are the dimension of the shower, please? Thanks! What kind of tub. Where can I find them. - What kind of tub. Where can I find them. Grout color? - Hi would you be able to tell me what grout color you used for this? Thank you! Floor tile - Is this porcelain? Where would I find this tile. I would like to do my bathroom floor with this. Thank you. Tub? - Who make it, & dimensions? Would you mind sharing brand and color? - The contrast of the whites and the dark grey are wonderful. Please share the color with us. Thank you! Where is the vanity chair sold? Love the floor. What is the name of the tile? What is the size of the tile in the shower? What is the name of the floor tile? What is the brand and name of this gorgeous tile? where can I purchase the chair? home owner - whats the size of marble at floor? Vanity Mirrors - Beautiful bathroom! Thanks for sharing it with us and answering all of our questions. It's hard to tell, but what mirrors are used over the vanity? Secondly, are the mirrors encased in white wood? Could you please tell me what you used for the countertop? Thank you. Size of wall tiles in shower - What are the dimensions of the wall tiles in the shower? Layout? - Hi! Can you provide a layout with room dimensions for this bathroom? What kind of marble is on the floor and walls and countertop? Bullnosed edges - Hello. Were the edges of the porcelain bull nosed on site? I would love to see a close up photo of the edges of the porcelain, if they are bull nosed. I'm thinking of installing a marble look porcelain, but not sure to bullnose the edges or add a schluter metal edge. This is the first bathroom I've seen that the edges look bull nosed. Thanks. Is the field tile Florentine Carrara (porcelain)? - Is the field tile Florentine Carrara (porcelain)? What is the dimensions of the total space? Closet and bathroom?